Yogi Baba Prem has received the traditional titles of Yogacharya and Veda Visharada recognizing him as a respected teacher of yoga and for having comprehensive knowledge of the Vedas. He has study in the fields of Karma, Bhakti, Hatha, Rajha, Jnana, Kundakini and Vedic yoga systems; as-well-as study in the Ayurveda, Vedic Astrology (Jyotish), and Vedanta. He is one of a small but growing number of westerners that have embraced deeper levels of study, having studied in the traditional Gurukula system. He has written several books, as-well-as numerous articles on spirituality and issues facing Hinduism. He has been published in India several times. He is the founder and Director of University Yoga/Florida Vedic Institute. The roots to Yoga and Ayurveda are found in an ancient group of texts known as the Vedas (Books of Knowledge). 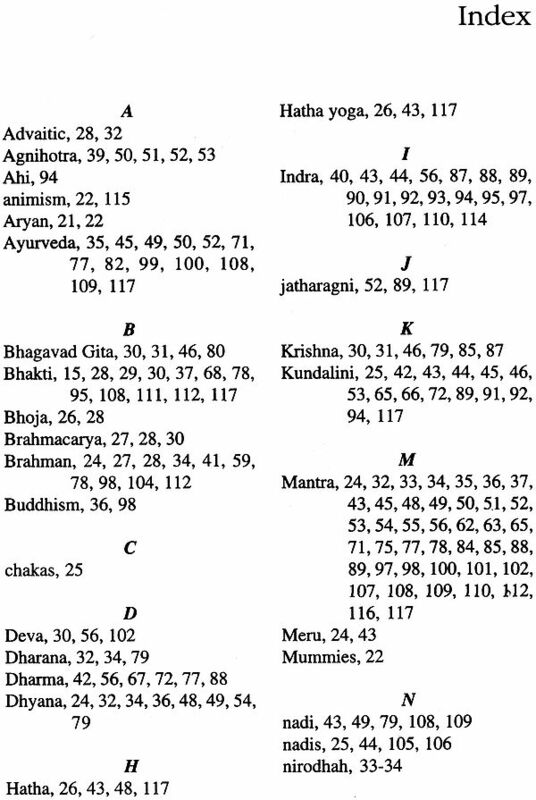 Portions of the Vedas give astronomical references dating back to approximately 6500 BCE; making them amongst the worlds oldest spiritual teachings still practiced today. To many modern readers, the Vedas are difficult to understand, as they are steeped in symbology, archaic language and multiple meanings for the same term, yet they form the foundation to modern Yoga, meditation and Ayurveda (a healing system). 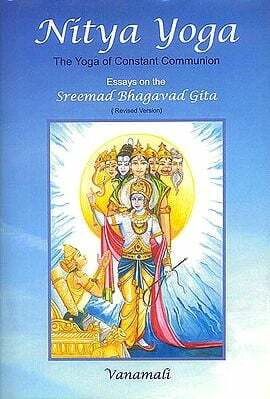 Yogic Secrets of the Vedas approaches these important teachings from a very practical view. Demystifying terms and symbology, examining various teachings, principles and mantras from the standpoint of how they manifest within the reader’s life on a daily basis, as- well-as their connection with Ayurveda. Continued from front flap Feminine form; examining the important role that the feminine form has within the Vedas and yoga, as well. A variety of different yoga systems such as Kundalini and Hatha yoga, and their link with the Vedas are examined. The reader is carefully prepared for an introduction into Vedic Yoga, the oldest yoga known to exist. Culminating in a new and different view toward deities, as-well-as their universal application in everyone’s daily life; providing simple but powerful techniques, and taking ones understanding of spirituality, Hinduism, Ayurveda and yoga to new and deeper levels. 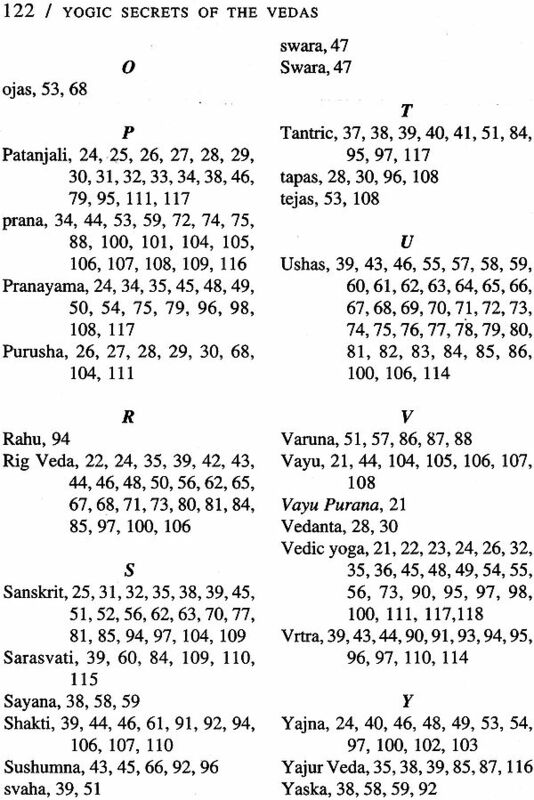 The reader is provided with a simple and effective program for beginning their own practice of Vedic Yoga, or easy techniques to incorporate into their existing yoga and meditation practice. In my personal journey of spirituality, after 25+ years of dedication and study, I have come to realize that within the perfection of the cosmos every step, every challenge, every opportunity was a result of my karma, blessings from God and Guru and as a preparation for the study of Vedic yoga. It can only be assumed that if you have found an attraction, interest, or casual glance at this book that your karmas are affording you an opportunity to grow closer to your personal time of deepening study and realization. It is a tremendous blessing, opportunity, and task to develop a serious study of spiritual principles. But in reality that is the purpose of life. All other issues are merely an opportunity to come closer to spiritual study, or to resolve karma in order to approach the spiritual path in a future incarnation. Either way spirituality walks with each of us every moment of every day. Today I will secretly celebrate with you the beginning of this journey towards Vedic Yoga. My personal journey towards writing this book is one that required over 25 years of meditation, study and practice. It seriously began in the late 1980s, after my kundalini first awoke. 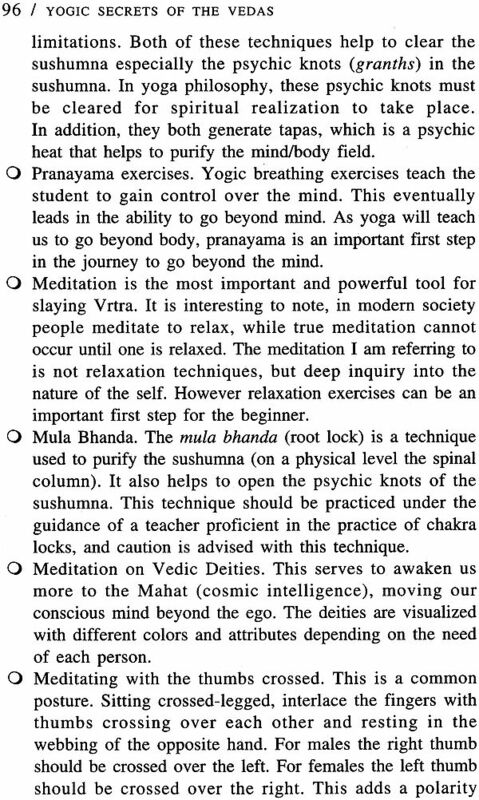 Working with the kundalini energy guided me toward the study of Sanskrit and ultimately the Vedas. In the initial years, virtually everyone told me that the study of Sanskrit and the Vedas was a waste of time. But yet, some unseen force, desire, maybe a longing continued to inspire me towards this study. After years of searching, experiencing rejection at every turn. I found Pandit Vamadeva Shastri (Dr. David Frawley). When we met, at his home in Santa Fe, New Mexico, I explained my desire to study the Vedas and lack of support from the yogic community and teachers. He calmly smiled, and we began a journey that would expand my spiritual understanding and provide a solid system of communication for fundamental communication of the mystical experience. Often the mystical experience is difficult to describe; as the limitations of language are often revealed when discussing the mystical realms. Regrettably, this has resulted in religion moving away from the mystical experience, or even valuing the mystical experience at times. Our lack of clear communication of the mystical experience has resulted in humanity slowly losing our understanding of the deep mystical states left by our forefathers, ancestors and saints. As new mystics have emerged over the past 100 years, they have attempted to create a new mystical language, but this has resulted in much confusion amongst students of different teachers. The Vedas and mystical teachings of the Vedas provide a unifying form of communication in regards to communication of mystical experience. Additionally, the Vedic deities represent universal concepts, truths and teachings. Understanding the Vedic deity, their role and function, has much to offer the modern study of religion, spirituality and mysticism. While modern society, especially the western world, has moved away from terms such as mysticism; this is primarily due to the propagation of falsehoods and incorrect information by religious zealots. The purpose of this book is to introduce the modern world to Vedic Yoga. As Vedic Yoga is probably the oldest form of yoga currently known to humanity; it is also the least know. It is most likely the mother of all yoga systems. 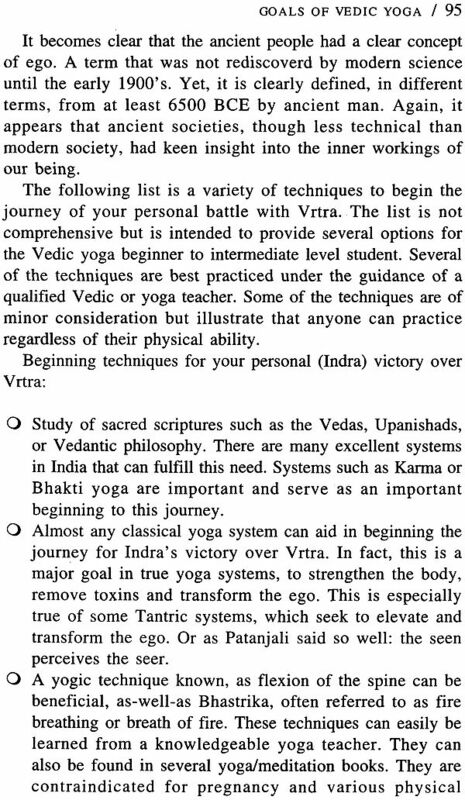 Within the Vedic yoga tradition, I found a comprehensive system that was extremely practical for the modern day student of yoga and spirituality. Additionally, I discovered a system that addressed many of the common day problems and challenges of our society. Vedic yoga offers important teachings and solutions for our current age. It also has the ability, as with all yoga systems, to meet the student at their current level of consciousness and gently begin to elevate them to higher levels of consciousness and realization. 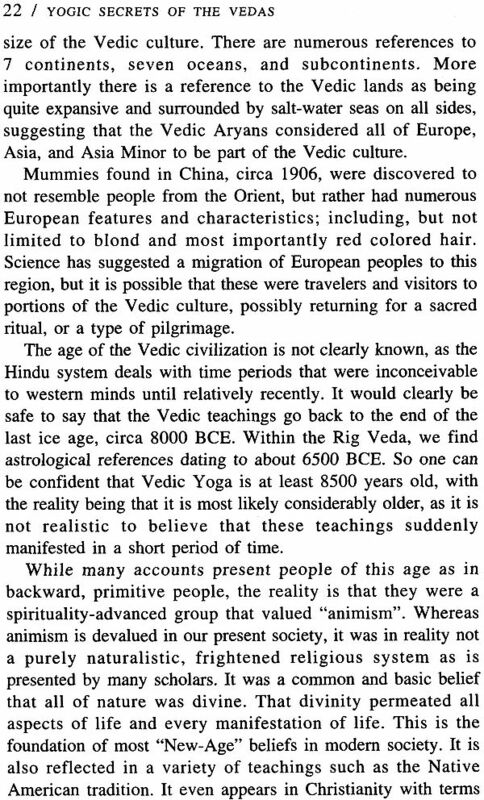 It also seems like our current age needs this information that the Vedic teachings have so carefully preserved over untold millennia. I feel it has been one of the greatest blessings in my heart to have had the opportunity to learn from and experience the Vedic teachings. It is important to note that this book would not have been possible without the nurturing guidance of Pandit Vamadeva Shastri (Dr. David Frawley). He has tireless served the world by providing some of the most important work on Vedic teachings, inspiring scholars globally; but more importantly, I find that he is the embodiment of the Vedic tradition comprising the important areas of kindness, generosity and knowledge. Over four decades of his life has been dedicated to sharing Vedic knowledge globally. His books are some of the most accessible and informative on Vedic subjects such as Ayurveda, Vedic yoga and Vedic astrology. Without his dedication, guidance and assistance, this book could have never have come into being. Yoga is the essence of Vedic philosophy, which aims at the unification of the human being with the greater conscious universe. Yoga, one could say, is the Vedic way of action, arising from the Vedic understanding of One Self and being pervading all beings and becoming. The specific term Yoga first arises in the mantras of the Rig-veda where it speaks of Yoga or yoking the higher intelligence (dhi) for the purposes of uniting us with the higher light of truth. However, many other aspects of Yoga and various synonyms for Yoga abound in Vedic texts, including commonly known yogic terms like mantra, dhyana (meditation), karma, dharma, prana and tapas. We should not reduce the spectrum of concerns associated with Yoga to a single term, even the word Yoga. In fact, the Vedas themselves are a path of Mantra Yoga that itself encompasses all the other Yoga paths of knowledge, devotion and works, including physical and psychological techniques, such as we find extending into later Vedanta and Tantra. Yoga, which is hidden in the Vedic mantras, is first clearly defined in the Upanishads (note, for example, Svetasvatara IV), the great spiritual scriptures of ancient India, in terms of Vedic deities of Agni, Soma, Vayu and Surya, the great powers of Fire, Moon, Wind and Sun, not as external luminaries but as lights of awareness, which is their inner meaning in the Vedas themselves. Yoga is defined in the Bhagavad Gita (Chapter IV) as an inner type of Vedic yajna or sacrifice, reflecting the inner yogic meaning of all Vedic rituals as offerings to the Divine within, which also exist in the earliest Vedic mantras as well. In the outer Vedic sacrifice, there are three main priests, the hota who invokes the deities with the mantras, the adhvaryu who makes the offerings, and the udgata who performs the closing singing and praise. These three priests are identified with the Vedic deities of Agni (Fire), Vayu (Air) and Surya (Sun). At an inner level, Agni is said to be speech and the hota, Vayu is said to be the mind and the adhvaryu, and Surya is said to be prana and the udgata. The inner Vedic sacrifice consists of offering speech, mind and prana, what could be called our ‘inner priests’ or guiding faculties, into the light of the indwelling Self. This forms the basis for the practices of mantra yoga, pranayama or prana yoga and meditation (dhyana yoga), the yoga of the mind. While the Vedic approach can be more complex and many sided than this simple formulation, with other variations and expansions on these basic correlations, this orientation should serve to provide the reader with a good idea of the inner Vedic focus. All that we see in nature is also a force within our own psyche and a power of Yoga or union with all. Unfortunately, few scholars or even yoga teachers, particularly in the West, have bothered to look into, much less discover the Vedic roots of Yoga, even though these are not difficult to trace for one who makes the effort. What is required is knowledge of the Vedic language and a sensitive mind to the meaning of Vedic symbols. Above all, one must be a practitioner of the Vedic teachings or their inner meanings cannot unfold. The Vedic texts teach karma yoga or the yoga of service and ritual at an outer level, which itself is quite sophisticated and complex. The Vedic texts themselves, composed of mantras represent mantra yoga at an inner level. 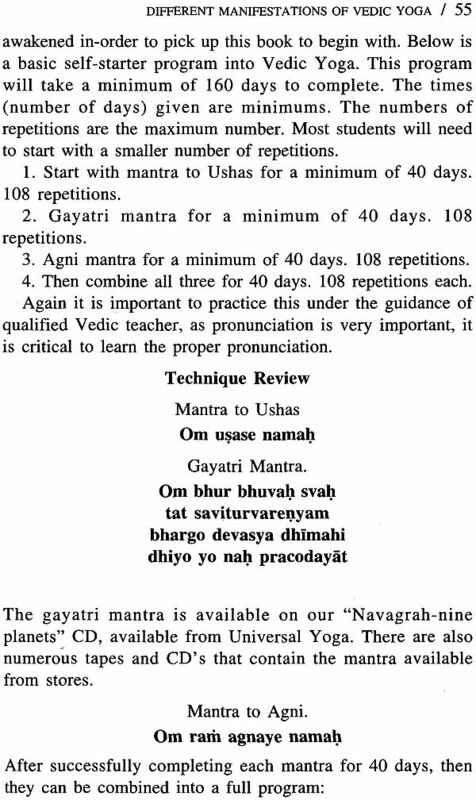 Vedic mantras, like the Gayatri which is still widely used as an aid to meditation by millions of seekers world wide, are not only mantra yoga but use mantra to promote knowledge and devotion as well. Mantra itself is the inner vehicle of all the Yogas. The Vedic hymns honor the Divine in the form of various Gods and Goddesses throughout all of nature, and in terms of all main human associations as father, mother, brother, sister, master, beloved and friend. 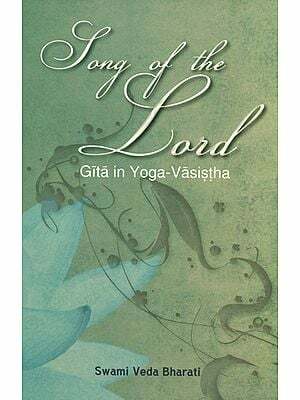 This worship, which is not only outer but also inner, provides the foundation of Bhakti Yoga or the Yoga of devotion, which is the main Yoga of the Rig veda in its many hymns of praise (Suktas) to the Divine as Thou or the main object of our adoration. Jnana Yoga or the Yoga of knowledge and Self-realization is more difficult to find clearly delineated in Vedic texts but commonly occurs hidden in the symbolism of many mantras, particularly the Vedic idea of searching out the supreme Agni or original light of truth in the spiritual heart in which the entire universe dwells. Surya or the Sun reflects the light of the Atman, and Indra or the Supreme Deity of the Vedas, indicates the light of direct perception. Soma, the Vedic nectar, itself at an inner level is the ananda or amrit from the meditative mind of the crown chakra or Sahasrara. Yogi Baba Prem is one of the few western yoga teachers who has taken the time and applied the energy to look into the Vedic origins of Yoga and delve into what the Vedic Yoga was likely to have been, as well as those intimations of its practices that still remain. He has made the considerable effort both to learn the Vedic Sanskrit, which is even more difficult than classical Sanskrit, and to uncover the yogic secrets of the Vedic symbolism, which can be quite arcane given the great antiquity of the Vedic teaching that reflects an earlier world age or yuga and its very different language and mindset. 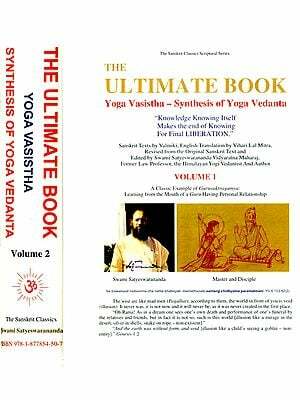 His book ‘Yogic Secrets of the Vedas’ provides a number keys to the yogic meaning of the Vedic deities and indicates several primary Vedic yogic approaches in detail. Such a deeper approach to the Vedic Yoga opens new ground for scholars and spiritual seekers alike: for scholars to take off their blinders and face the depth of Vedic mysticism and for seekers so that they can employ at least a few Vedic practices in a meaningful and contemporary manner. Vedic deities like Indra, Agni and Ushas come alive for his readers and began to move and spiritual forces within us under his inspiration. I have known Baba Prem for many years now and have seen his many insightful articles and books on Yoga, Ayurveda, Vecla and Tantra. I have seen the important research that he is selflessly conducting and have encouraged him to publish it. In this regard he moves in the line of scholars more in the Vedic tradition and in lines of great modern gurus like Sri Aurobindo and Kavyakantha Ganapati Muni. India often provides a more fertile ground for sharing such deeper studies, as I myself have discovered with my own work, so it is good to see his work presented to the Indian audience as well. Such work on the Vedic Yoga as he has done is necessary today to help us reclaim our global spiritual heritage. It helps link us once more to the wisdom of our ancient spiritual ancestors that we desperately need to move out of our current global crisis, caught as we are between the two evils of commercialism and religious fundamentalism that are literally destroying our planet tearing the human psyche apart as well as the Vedas restore our living link to the sacred universe that no church, government or business can own or represent. It is my hope that the book will gain a good readership among serious practitioners and dedicated seekers, as well as open minded and intuitive scholars. Yoga students and teachers in India should look at the book to see that knowledge of the Vedic Yoga is again rising in the Western world, which they are used to, in the line of Max Mueller, seeing only the outer face of the Vedas and missing the inner heart. Such studies can help stimulate them to conduct similar research of their own. A yogic renaissance is necessary today, with new insightful approaches to yogic teachings, not so much for the body but for the higher mind and spiritual heart. The Vedas provide the mantric key to that highest endeavor of humanity to return to Unity. The writings of Yogi Baba Prem help lead us in that direction as well. For untold millennia, mankind has struggled with its history, heritage, and lineage of knowledge. Within modern history, we have seen a great distortion of its secret truths. Regrettably, the record of history will always contain a cultural predisposition or bias. And apparently, history will always be recorded from the perspective of the victor or dominant group. This ultimately results in a great distortion of a plethora of subjects, histories, and religions. While it would be correct to say that many valiant souls have struggled to maintain a precise record of the known history of humanity, in reality very few laymen have the opportunity to explore the vast amount of information currently archived within modern academia. In fact, few scholars have the time to wade through the copious volumes of recorded information. Within the view of world history the distortion of facts appears no stronger than within religion and spirituality. The distortion of religious teachings and history has a shaded history with drama that would rival any modern movie or book. It is filled with violence, political agendas, deception, greed, lust for power, and other qualities that we as a society currently value in fiction writings. 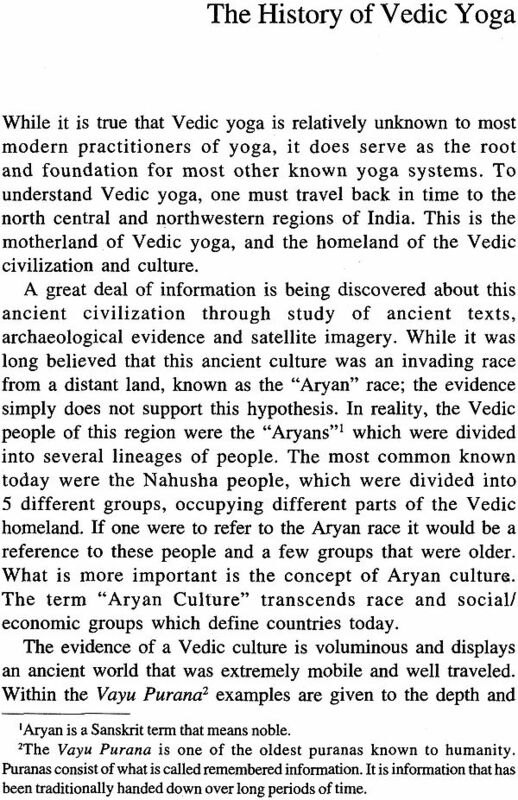 Within India’s Vedic tradition, we find blatant examples of distorting historical teachings and facts by external groups. Additionally, we find that the purity of the ancient teachings of yoga have been colored by western scholars; while noble in their scholarly pursuits have sometimes missed the forest for the trees. My personal journey, towards the Vedas and to literally experience the Yogic Secrets of the Vedas, began with the study of yoga and my own personal Kundalini awakening experience in the mid 1980’s. As I learned to work with the Kundalini energy, I found myself drawn to Sanskrit initially, and this led to a powerful attraction towards the Vedas. Most teachers that I encountered had little or no knowledge of Sanskrit, or of the Vedas. In fact, I had to teach myself basic Sanskrit with the aid of home study courses and a powerful desire to learn more about the Vedas. Once my initial basic study of Sanskrit was complete, I sought out information on the Vedas. It was difficult to find quality information on the Vedas, and the naturalistic interpretations from the late 1800’s were quite prevalent. I would meet with western teachers and express my desire to study the Vedas, only to be greeted with a bewildered look and most commonly the question, “Why?” It was difficult to answer, their question. I did not know enough about the Vedas to even know why. But at the same time, I could not resist the powerful impulse to learn about the Vedas. It seemed, intuitively to me, that great secrets were contained within it. Possibly, the Vedas contained solutions to the world’s challenges, or a knowledge or technology that the world was in need of. My search continued for many years. I was becoming familiar with the work of Dr. David Frawley (Pandit Vamadeva Shastri). He, at the time, had written several books on the Vedas and Vedic teachings. These books seemed to “feed the need” that my mind called out for. I eventually had the opportunity meet him in the United States, and discussed how no one could support my desire to study the Vedas. He just smiled, but also proceeded to guide my Vedic study over the next decade; teaching me about select vedangas and upavedas, and nurturing my study of the Vedas itself. It is through this process, that this book is even possible. Eventually, I received the titles of Veda Bovid for proficiency with the Vedas, and then the traditional title of Veda Visharada meaning a more comprehensive knowledge of the Vedas. Pandit Vamadeva Shastri’ s work has ignited a reawakening to the Vedic teachings and in particular Vedic yoga. This is important as the Vedas serve as the mother of all yoga systems. Regrettably, few yoga teachers’ focus on the Vedas or the important teachings they contain, and a great deal of confusion exists regarding the Vedas to this very day. It is my hope that this book will open the way for the reader to experience a small portion of the Vedic concepts and teachings; possibly opening the door towards greater realization and understanding, practical application of Vedic knowledge in their daily life, as well as their sadhana. The Vedas are amongst the most practical spiritual teachings I have ever encountered. Providing a deep spiritual teaching that is steeped in practical application, as-well-as deep mystical insight into the nature of humanity and their relationship with divinity.